This magnificent bird is presently a species so much hybridized that often it is not possible to exactly understand if the specimen in front of us corresponds precisely to the holotype described by the one who has classified it or if it is a new crossing just obtained. There’s no zoo, naturalistic garden, educational farm or breeding of birds enthusiasts that does not have among the detained specimens this particular pheasant with such garish colours. By sure, the vulgar name given him by many European populations has not been the fruit of studies or of literary or scientific speculations so much exploited in giving spectacular names to exotic birds. 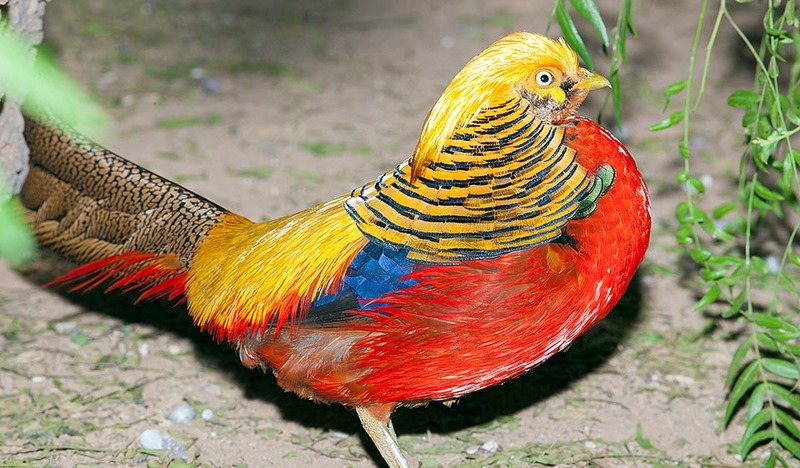 It is easy to think that the name of golden pheasant given to this bird, is nothing else than the fruit of a natural intuition that we get when we observe it the first time. Gold is the most garish colour present in its livery. In fact, as we shall see, also Linnaeus had reached long time before, the same conclusions. Introduced in Europe in the XVIII century, verified its prolificacy and the ease of taming, it was immediately taken into account by the breeders of that time who upgraded its diffusion in all the continent. With the same interest, they began to hybridize the original species with other varieties and similar species, till to obtain so many variations of shades and colours to often render difficult the certification of the origins. Nowadays there is no place in the world, even remote, where this bird is not present in captivity. It has been also assisted in all continents and at the suitable latitudes, to a diffusion also in the feral state consequently now there are stable colonies in locations it might have never been able to reach by natural means. 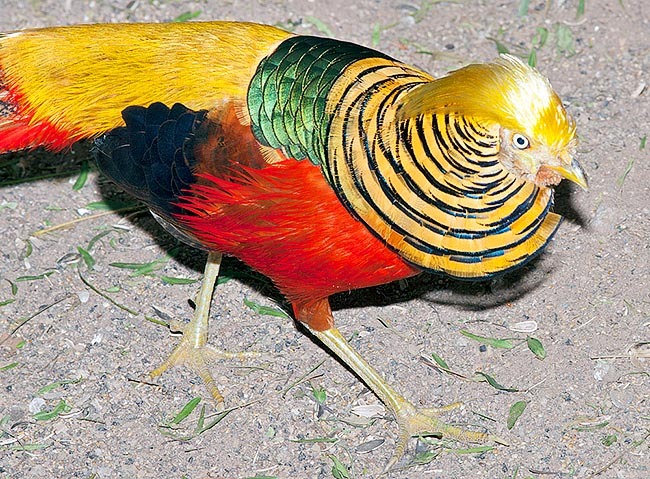 The Golden pheasant (Chrysolophus pictus Linnaeus, 1758) belongs to the order of the Galliformes and to the family of the Phasianidae, birds present in allcontinents and at all latitudes. Initially it was classified in the genus Phasianus getting theetymological origins of the name from Phasis, river of the Colchis, the present Georgia, where did live the famous common pheasants to whom the Argonauts, during their mission in quest of the “Golden fleece”, had given the name of Phasian. The present genus Chrysolophus gets origin from two old Greek terms, “khrusos” = gold and “lophos” = crest, rightly to describe one of the peculiar characteristics of this bird and the species from the Latin term “pictus” = painted. In Europe it was called after the forementioned impressions. 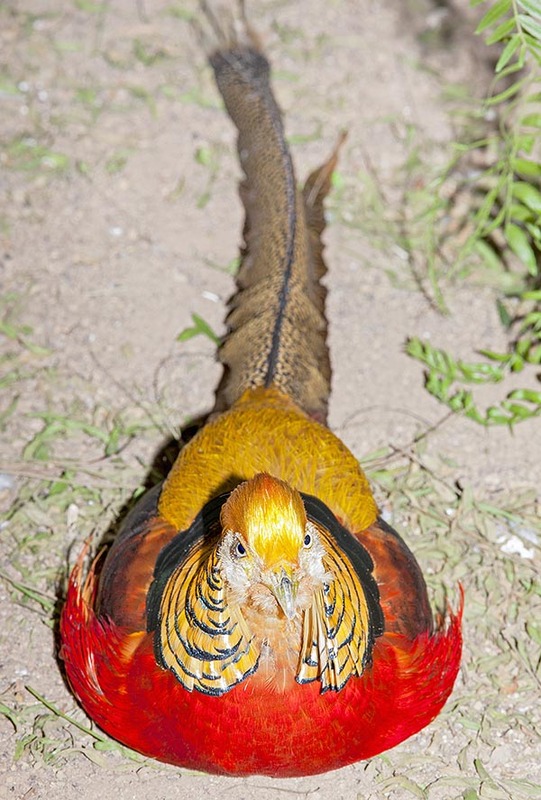 In English, Golden Pheasant; in French, Faisan doré; in Spanish, Faisán dorado; in German, Goldfasan; in Italian, Fagiano dorato and in Chinese, its native place, ken-ki = golden chicken. The origin area of this pheasant is the woody zone of Mongolia and of Western China but nowadays it is widely introduced and diffused in all continents, in the areas reflecting the environmental and climatic conditions of its origin territory. As we do not know much about its wild life and about the real consistency of its populations, it is conceivable to think, as now happens with many species, that the number of the birds held in captivity is greater than that of the free ones. Though coloured and well showy, this bird is fairly shy and very difficult to be sighted in its natural habitat. The thick forests, often of conifers, with dense shrubby underwood, thickened in turn by a grassy layer at times impenetrable, is a perfect ambient for camouflaging whatever animal of any colour. Moreover, being a typically terrestrial bird that sees it spending all the hours of light on the ground immersed in this low brushwood, is able to lead an absolutely reserved life and often escapes from view of observers and aggressors. It hardly takes off if not obliged by survival emergencies or for reaching some female during the reproduction period but prefers to run on the ground displaying mobility skills and impeccable abilities in extricating in the thick underwood.On the night, as often pheasants do, here it is going up at a fair height on trees and perching for the night on big leafy branches safe from terrestrial predators. It lives at altitudes of not more than 1500 metres and during the winter season it loves to go down in the bottom of the valleys in forests of broad leaved trees, looking for food and for overcoming the adverse atmospheric conditions but goes back to its home territories as soon as the good season appears. 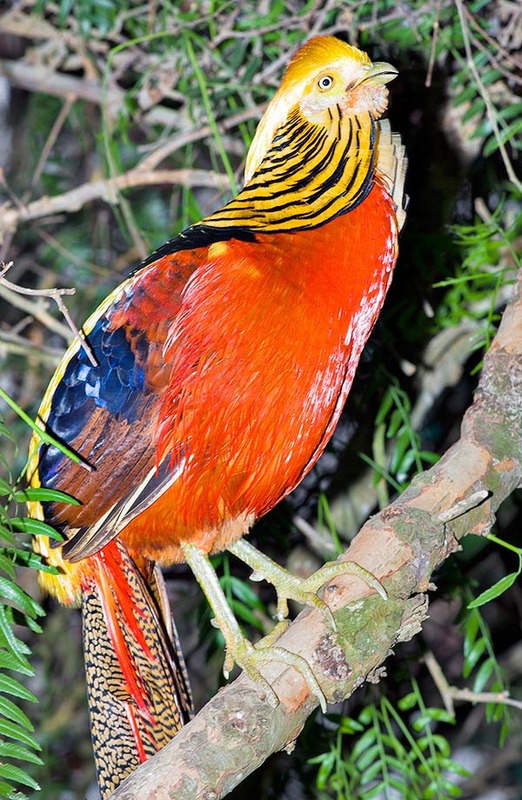 Apart from this small altitudinal migration, the golden pheasant is considered as a sedentary species. It is not easy to list all the colours present in the livery of this magnificent pheasant and place them in the right position, seen the huge variety of shades and the odd order of the same on the body. By sure, it is easier to observe one of its photos in nuptial dress and admire in the details this incredible palette than to try to describe it. The gold colour is present on a hood/crest that goes down on the nape and on the lower part of the back till the tail set. The vermilion red wholly covers the throat, the chest and the sides and creates trousers that partially attire also the upper part of the legs. On the lower part of the nape is present a delicate cover of orange colour, with thick black transversal striae, fruit of an extension of the neck feathers forming an extremely elegant shawl. Is also present a vast scapular blue spot that contrasts with the golden yellow of the lower part of the back. Blue nuances are well visible also on the alar coverts. The tail is much elongated, of white-yellowish colour strongly and finely dotted of black, with fathers mixed to others slightly shorter of a lively red colour. Vivid yellow eyes; bill, cere and legs are yellowish. It is a difficult task to list all of them accurately. Conversely, the female has brownish brown colours with remarkably shorter tail. In these the iris is, unlike males, brown since when young, characteristic that remarkably facilitates the sexing of the immature specimens. 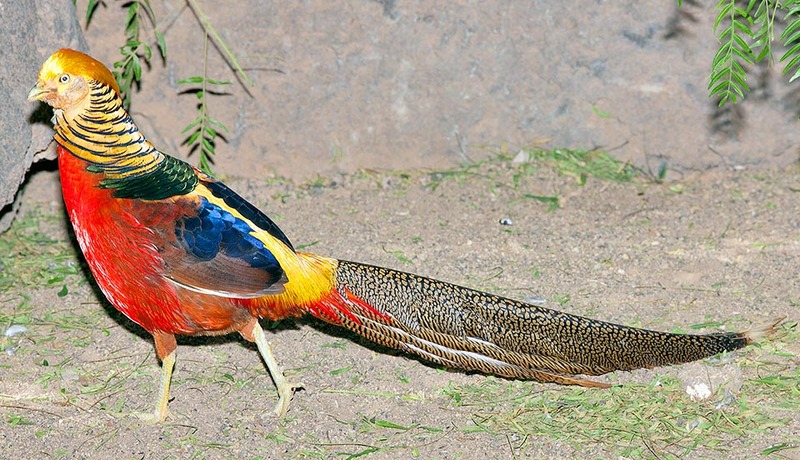 The male of the golden pheasant is about one metre long of which about 60/70 cm for only the tail and a with a weight that in the male may reach the 900 g. The wingspan may exceed the 70 cm. The young get the adult livery on the second year, assuming with the increasing age, more vivid and lively colours. In captivity this bird is bred only for ornamental purposes even if it has an excellent and very tasty meat. 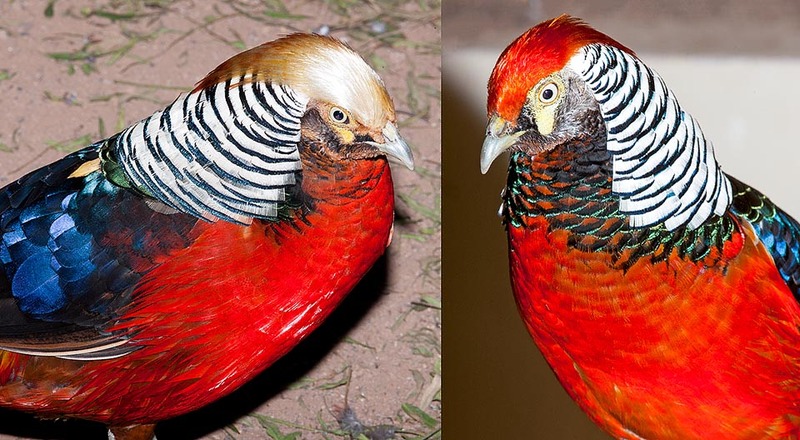 Various hybridizations have been obtained with the congener Lady Amherst’s pheasant (Chrysolophus amherstiae) with production of fertile specimens that then have generated successive and always more intricate crossings. The golden pheasant nourishes of seeds, buds, small invertebrates and insects it finds rummaging in the underwood scratching about in the same way as our chicken and usually all pheasants do. It is usually silent except during the period of the matings when it emits a characteristic and resonant call. Also when it takes off suddenly it emits a rapid and squeaky song, added to the typical noise caused by the very fast flapping wings, sounds that scare and that divert for a moment the attention of the intruder or of the possible aggressor. It is typically polygamous but the number of the females is usually very reduced. The female lays 8 to 12 cream eggs, in a slight sinking in the ground covered by dried grasses and by soft feathers that the mother itself loses during the brooding and that gradually increase in quantity while the operation continues. The mother is an assiduous brooder and leaves quite rarely the breeding often giving up eating and drinking for very long periods. After about 23/25 days come to life precocious and well feathered chicks that leave the nest as soon as the brooding is complete. The mother cares the young for about one month before the total independency even if these are able to nourish autonomously already from the first day of life. However, the young remain with the mother in family groups for various months. Incredible, is the fact that they are able to take off after only two weeks from the birth even if their size is very much reduced and such to render them similar to small quails. It seems that Pliny the Elder has identified in the famous Phoenix this bird with its brilliant colours. In the Chinese tradition and in the paintings of the old dynasties this bird is often reproduced and reminded in the popular tales. Finally, during the Nazi era, with the term “golden pheasants” (Goldfasan) were ironically called the top officials of the party, so much pretentiously adorned with medals and coloured uniforms to look like one of them.